I spent a very enjoyable overnight stay in Cardiff. 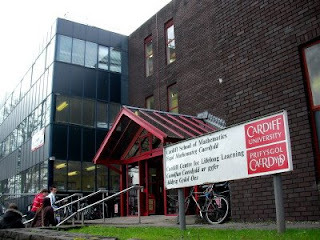 I gave my careers talk at the School of Mathematics, University of Cardiff (pictured below) and had lunch afterwards with Julie Hepburn, who acts as the AGCAS half of our AGCAS-IMA link. We talked about the ways we can work together to promote maths careers. Recently Julie distributed an email to careers advisors on my behalf talking about the good careers resources available from the IMA directly and through the Maths Careers project and offering to give careers talks, etc. 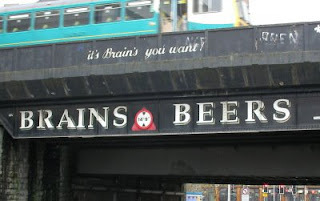 While I was in Cardiff I met Gareth Howell of the IMA Younger Members Group for a drink and I did indeed do what the bridge says and drink Brain’s (below; if ever there were a need for misapplication of an apostrophe! Just one small grammatically correct mark away from being a zombie direction).